10:00 AM – Deepa Subramaniam – Whats New in Flex 4 that’s NOT Spark! ** Tuesday night I’m trying to organize a multitouch ‘Birds of a Feather’ gathering. Shashank’s preso looks really cool. He is extremely knowledgeable and I’m really looking forward to seeing how he presents the topic and what tips and tricks he has found useful. We can start by doing the usual multitouch dance. 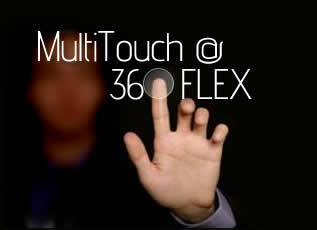 Make sure people don’t have questions about multitouch that the group can address. I’ll also bring some demos and fun stuff that everyone can play with. Largely, I’d like to steer the conversation towards exploring ideas on open source multitouch projects. 1. Some sort of gesture framework that builds on the raw touch event. 2. Open source SimTouch application and how it could be better. 3. An open component library – I’m mostly interested in putting together a location where a team can post multitouch focused components or utilities. I’ll recommend a super liberal license so others can use the work as they see fit for their own personal projects as well as commercial endeavors. If you are at all interested in these topics please do me a solid and swing by the BOF session on Tuesday night at 6:00 PM. If you can’t make it try to find me wondering around the conference. I’ll give anyone interested a free MultiTouchup sticker. I’d just like to hear what you think on the subject. This entry was posted on Saturday, March 6th, 2010 at 8:53 am and is filed under Blog. You can follow any responses to this entry through the RSS 2.0 feed. You can leave a response, or trackback from your own site. MultiTouchup.com Entries (RSS) and Comments (RSS).